Green bonds are a perfect entry point for someone interested in making a social investment. Like other bonds, you pay a certain amount of money for the bond now to get a larger amount of money at a specific future date. With green bonds, your up-front investment is used to finance environmentally friendly projects. They're relatively low-risk and provide critical funds that are urgently needed in the short-term for these green initiatives. Chances are that if you have any type of retirement account, at least a portion of it is invested in mutual funds. If you'd like to use that money to support green projects, choose green funds when allocating your investments. Broadly speaking, these investments are also included under the umbrella of socially responsible investments. As an investor, you also have the option to invest directly in companies that have a green mission, product, or service. This means you can buy stock in a publicly traded company that produces renewable energy products such as solar panels, or any other "green" mission of your choice. One of the riskiest (but perhaps one of the most potentially lucrative) green investments you can make is in a green startup. There are plenty of entrepreneurs who are founding companies in the environmentally-friendly space. They range from new composting techniques, to energy-saving products, to innovative concepts such as carbon credits that are bought and traded to compensate for energy consumption. Many companies are taking up the green mantle by transforming their products and using renewable resources. Some also pledge a portion of their earnings to environmental nonprofits, and support green efforts in the communities where they operate. These companies can contribute enormously to protecting the environment, and supporting their efforts with your investment dollars and purchases can help encourage them to continue and enhance these practices. As always, it's important to make informed investment decisions. It's best to educate yourself about these options by reading about the ins and outs of green investing. I also suggest seeking the advice of a professional financial advisor before making any investment decisions. Together, we can build a bright future for ourselves and for the planet as a whole through our investment dollars. Interesting topic. Your only criteria for investing shouldn't be whether an investment is "green". It should still be a sound financial investment or else you will lose your green money. 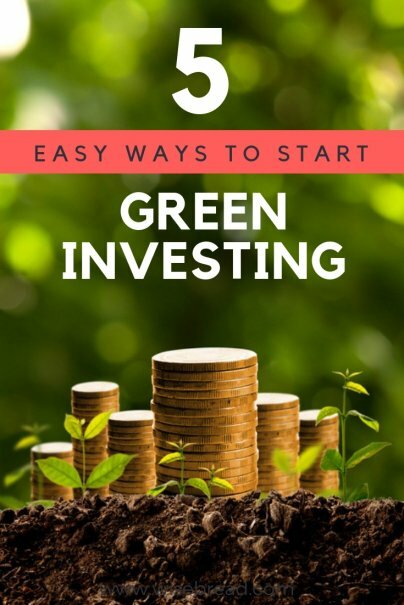 great tips, green investing is the way to go. As said, do your research, get advice - always good to be careful of newer companies without a solid track record, they can be tricky in the field of emerging renewables (ie biofuels!!!) happy green investing!